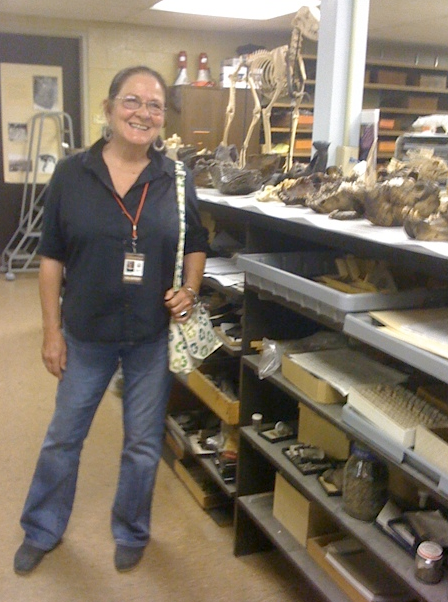 My mom, Dixie Swift, would not describe herself as a scientist, though the trajectories of her interests and passions criss-cross through art, paleontology, and biology. As long as I can remember, my mother has been teaching herself about the construction of animals and sharing the lessons she has learned from skeletons. When I was little, Dixie would bring home (living) animals from her science lab in an intercity Los Angeles middle school. She would drive kids from Compton in the back of her truck (well before the seatbelt laws went into effect) to the Bolsa Chica wetlands to set the wild ducks free after they had been nursed to health in her class. Her classroom was highlighted as a model that educators from all over came to visit and learn from. Former students, parents and colleagues still remark on her impact. While she practically had a living zoo in her classroom (sometimes horrifying neighboring classrooms when animals would get loose), her personal interests were more focused on the interiors of animals. We lived at the beach where Dixie would bury dead seals or sea birds she found. She’d dig them up after awhile and boil the bones on the stove to remove what was left of body tissue. The smell was awful, beyond awful. Carcasses of smaller animals or animal parts would wait their turn on the stove wrapped in foil in the freezer. Our family knew better than to open foil packages hoping for leftovers. While I was in high school, my mom learned how to do taxidermy on a pelican, taking photographs of the process so that she could recreate the musculature in pencil drawings. “Isn’t this beautiful,” she exhort as she showed me the photographs she snapped while she explored the bird’s chest cavity. I joke about my growing up surrounded by these smells and visions as the making of my vegetarianism, but in truth, having this unusual maternal role model shaped my belief in the importance of sharing the beauty, dignity and value of science. What’s more, Dixie continues to inspire her grandchildren. She volunteered in my daughters’ 3th grade science classes teaching the kids about skeletons by making chicken vertebrae necklaces with them. Her house is still filled with completed skeleton reconstructions and projects waiting to be initiated. Just last week, I was looking in her freezer for an ice pack and hesitated rooting beneath the top layer. Good thing, there was a foil wrapped raccoon paw buried in there I was told later. Dixie feels most at home at the Page and often remarks that had she known that this career could have been a possibility for her, her life would have taken a different turn. Even so, I doubt that I would have come home to the smells of freshly baked chocolate chip cookies. This entry was posted in Biology, Paleontology and tagged Biology, Paleontology. Bookmark the permalink. Thanks for the insight, Dixie Swift is an amazing woman in a league of her own, and continues to inspire! Dixie continues to inspire. Her granddaughter loves anatomy, recently completed volunteering at the Page lab and intends to go into medicine. I met Dixie Swift in 1967 when I was in High School and became a Quaker because of her. Later in college, I volunteered in her third grade classroom in Compton as part of my prep for teaching in the inner city. I later taught in Watts for eight years. I needed a model of a independent working woman and Dixie provided that for me in spades. I loved her values, passion, creativity, honesty, humor and patience. I am deeply grateful for her influence in my life. And I am glad to see her doing well and continuing to do wonderful things.